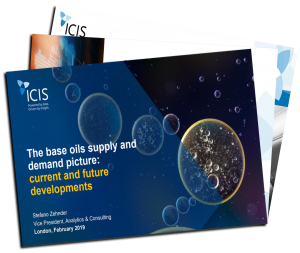 Following the success of the ICIS World Base Oils Conference in London, we would like to give you the opportunity to download the presentations slides given by ICIS Vice President, Consulting, Stefano Zehnder. The presentation will give you an overview of the base oils supply and demand and their impact on the current and future commercial strategies. 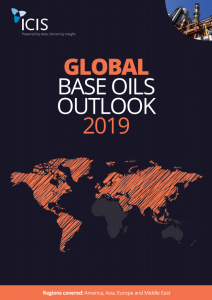 ICIS global editors; Matthew Chong, Vicky Ellis, Sarah Trinder, Izham Ahmad and Judith Taylor report on trends that influenced the base oils market in 2018 and what to expect for 2019 in the Global Base Oils Outlook 2019. Drawing on the knowledge, expertise and reach of a global network of reporters, our coverage of the petrochemical industry spans more than 180 chemicals, including base oils, naphtha, olefins, aromatics, polymers and more.